Gain the skills and knowledge to build custom digital document workflows to meet complex business needs. 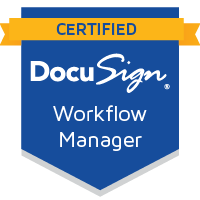 Designed for creators and senders of DocuSign documents, the Workflow Manager Certificatoin will teach you best practices to improve document effectiveness, signing speed, and DocuSign adoption. DocuSign users focused on building document processes, creating recurring documents, and executing advanced business document routing. Those looking for account set up, maintenance, and customization should attend the two-day Administrator Certification. Attendees have the opportunity to earn their certifiaction by completing a written and practical exam. There are no Workflow Manager courses scheduled at this time. Please check back soon!